We haven't had any more lambs born yet. A few of the ewes are walking "cowboy" as their udders are swollen beyond belief! Those lambs will come when they are ready to be born, I guess. Yesterday, was day three in the jug for BFL X Cheviot lamb Helena. It was time to leave the jug. We weighed her - she had gained 2 lbs. 2 oz. in just three days! We tagged her and then we did something we haven't had to do before. We banded her tail. 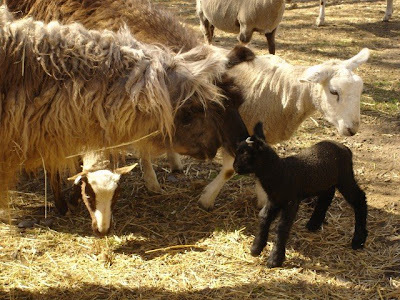 Shetlands have naturally short tails and don't need banding. Sheep born with the long tails are prone to fly-strike, which is pretty nasty, from what I have heard. So the crossbred sheep will need banding. Basically it involves placing a very thick, strong rubber band on her tail which cuts off blood supply; the tail is supposed to fall off in a week or two. 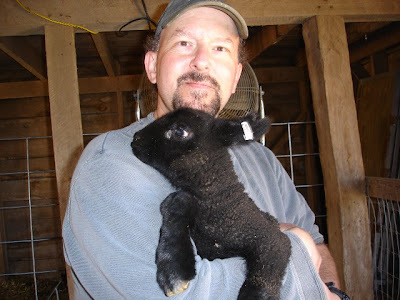 I have been told the lamb usually runs around for about ten minutes and then calms down. Helena handled it better than I thought she would. She jumped around in circles a few times and wiggled her tush a bit, then settled down and was greeted by the rest of the flock. Helena greeted by Nessarose and Mina. Mom is keeping a close watch. And as a side note, Nessarose has not had a cria. We are thinking she did not hold her pregnancy. We will breed her this year and try again. She certainly is showing interest in the lamb. I think she will be a good llama mama when her time comes. So now we move to Llama Watch, Round 2. Karma is 1/2 sister to Nessarose. They have the same sire, different dams. Her earliest due date was Monday. Helena is SO cute! Sorry Nessarose didn't have a cria this time. I hope Karma does. Crias are so cute too! She sure is a cutie pie! You need to have a talk with your ewes though and tell them they need to get their act together! !